Nutritics provides a large number of portion sizes for foods in the database. These are assigned to foods from various portion size resources, manufacturer’s data or from direct weighing by trained Nutritics staff. Click on the box under the corresponding entry point (day/meal/qty) to enter a portion size. A smart portions box will open if they are available for the food chosen. 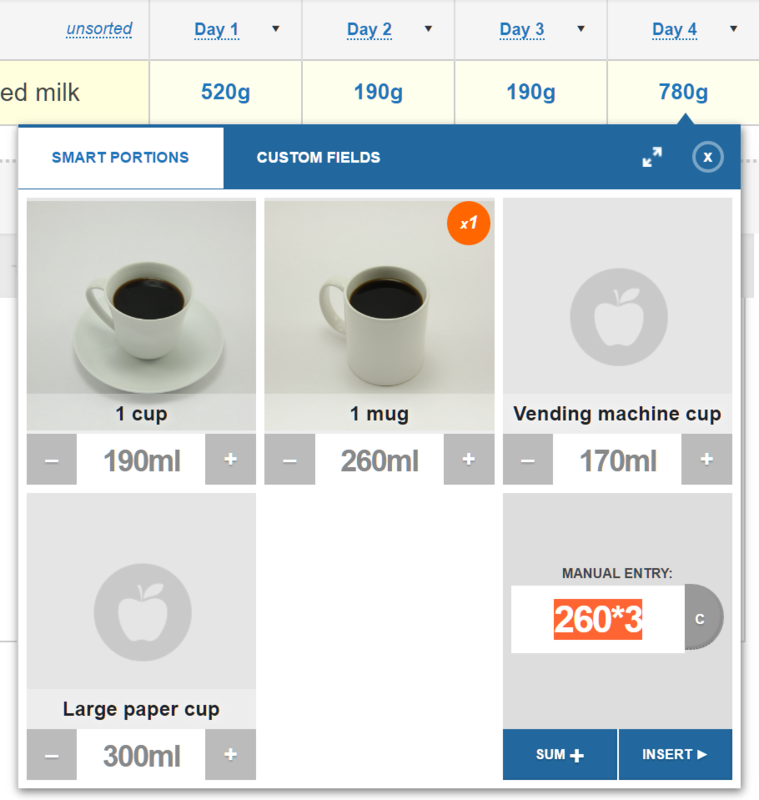 Use the plus and minus buttons to modify a smart portion. A single press on + will add 1 to the portion multiplier, while a single press on – will subtract .5 from the smart portion. This enables flexible entry of smart portions. It is also possible to manually type a quantity in the box provided in any unit of measure. Clicking the sum button will add the amount entered to the existing quantity, and clicking insert will replace the existing quantity. The grams display box also functions as a calculator if you want to add individual weights. You can add, subtract, multiply or divide by typing the symbols +, -, *, / respectively. In addition to portion size suggestions, Nutritics also provides demographic portion size options for many foods, which have been adapted with permission from the research on the National Diet and Nutrition Survey by Wrieden & Barton, 2005. These portion sizes take account of your client’s age and gender and indicate the average portion size consumed by this demographic group.